After 7 years in the works, my book is out, from Cambridge University Press, May 2017. 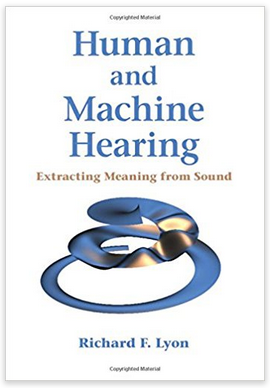 See machinehearing.org for where to buy, discounts, reviews, errata, discussion, etc. New: "Kindle Companion" free PDF – all the figures and boxes in one high-res file (55.5 MB), including color images. I don't have copies of all my 70 issued US patents on-line, but can provide them on request. Here's a PDF file of all their front pages. Abstract: A cascade of two-pole–two-zero filter stages is a good model of the auditory periphery in two distinct ways. First, in the form of the pole–zero filter cascade, it acts as an auditory filter model that provides an excellent fit to data on human detection of tones in masking noise, with fewer fitting parameters than previously reported filter models such as the roex and gammachirp models. Second, when extended to the form of the cascade of asymmetric resonators with fast-acting compression, it serves as an efficient front-end filterbank for machine-hearing applications, including dynamic nonlinear effects such as fast wide-dynamic-range compression. In their underlying linear approximations, these filters are described by their poles and zeros, that is, by rational transfer functions, which makes them simple to implement in analog or digital domains. Other advantages in these models derive from the close connection of the filter-cascade architecture to wave propagation in the cochlea. These models also reflect the automatic-gain-control function of the auditory system and can maintain approximately constant impulse-response zero-crossing times as the level-dependent parameters change. Copyright (2011) Acoustical Society of America. This article may be downloaded for personal use only. Any other use requires prior permission of the author and the Acoustical Society of America. The article appeared in J. Acoust. Soc. Am. vol. 130 and may be found via http://asadl.org/jasa/resource/1/jasman/v130/i6/p3893_s1. Europe 2003, Spring 2005, Spring 2005, Santa Fe 2006, Death Valley 2007 (some SD14), Switzerland 2007 (all SD14). * Slides for ICIP plenary talk "History and Future of Electronic Color Photography"
* Video of my October 2007 talk at the Berkeley Ear Club, "Cochlear Modeling Retrospective"